1/4 lb All beef hot dog served on a steak roll. All dogs come with a choice of Ketchup, Mustard, Onions, BBQ, Hot Sauce & Relish. The Valley's newest burger concept. The Burger Shack's STUFFED burgers are unique in that the delicious ingredients are stuffed in the beef. Our 94-percent lean beef is naturally raised on open-range pastures, without using any steroid implants or antibiotics. It is safer and healthier for consumers because it is not the usual white fat-laced beef purchased from the grocery stores. Our beef is high-quality, triple ground, and no fat or additives. When we say, ALL NATURAL, we mean it! Fresh. Simple. Honest. Opened on 11/11 (good sign?) 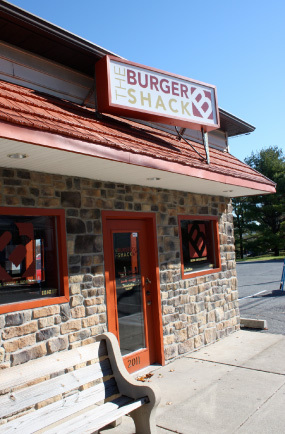 of 2010, the Burger Shack has a rapidly-growing fan base. The most popular burger on the menu is the Bungalow: A fresh ground beef patty stuffed with cheddar cheese and bacon, then topped with more cheddar cheese and bacon. And make sure to check back each month to see which burger will be chosen as the BOTM (Burger of the Month). Forget the normal chains. No run of the mill stuff with "I don't want to be here, and what do you want now" staff in this place. The burger shack makes a real burger, and they will truly make it your way. Not to mention their enormous dogs with all the trimmings, wraps, salads, wings........wow.... this presents one big challenge, which one of their delicious foods are you going to have this time? If you're looking for friendly service and excellent food, you can't beat the value and the flavor is top notch. Not to mention, where else can you get this type of food delivered? Found a new burger place! We pass by this place EVERY day and always thought about stopping in. Boy am I glad we finally did! I had their pulled pork wrap and it was EXCELLENT! Also tried their hot & honey wings...all I have to say is AMAZING! Great job on the crispiness of them. We always hate soaked wings, you won't get that here. Just the right sauce and crispiness! I love the fact they also have sweet potato fries, mmm good! I have no complaints. Be the first to review The Burger Shack!